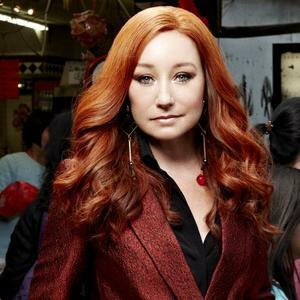 You'll recall how much we loved Tori Amos's London show with the Apollon Musagete string quartet last year so it'll come as no surprise that we thought last night's Royal Albert Hall performance with a full orchestra (Dutch virtuosos, Metropole Orkest) was absolutely [ ..... ]. That blank signifies a superlative not yet invented for just how good last night was. Come to think of it, it's puzzling that this is the first time Amos is touring with an orchestra after 20 years in the business, having regard to just how well some of her discography lends itself to classical accompaniment. Yes, she gave it a one-off go a couple of years ago, which is what subsequently led to 2011's Night of Hunters album as well as this year's orchestral career over-the-shoulder glance, Gold Dust. Presumably the logistics of transporting a 56-stong "band" with you are neither easy nor cheap, hence the rarity that is the current mini orchestral tour. Gold Dust re-imagines cuts from various stages of Amos's career but last night special emphasis was put on her early 1990s output from the Little Earthquakes and Under the Pink eras. Opening the set with b-side, Flying Dutchman, Amos forgot where to come in with one of the first lines on the new arrangement, exclaiming to the audience, "I fucked it up again! ", in reference to a similar glitch on the tour's first night in Rotterdam on Monday night. Restarting the song, Amos immediately got back "on it" with the vocals bouncing beautifully across the Royal Albert Hall's sphere and the arrangement remaining fairly loyal to the original recording from 1991. For many Amos fans the Gold Dust track-list has been disappointing in that some argue the new versions not to have injected anything fresh into the originals. But listening to John Philip Shenale's arrangements of the songs live last night, it seemed possible that the album's re-recordings were selected and done with the live rendition strongly borne in mind. What may sound 'just good' on the record sounded incredible last night. Classics such as Precious Things, Silent All These Years and Winter did not stray wildly from their recorded counterparts but their live performance with the Metropole backing (complete with fresh introductions and built-in improvisations), gave them extra ardour and also acted as a reminder of just how terrific and timeless these ageing compositions still are. Amos's songwriting, often lazily dismissed as 'kooky', always stands out when you hear her sing her songs live and last night was no exception. Yes, Marianne opens with the unintelligible line, "Tuna / Rubber / Little blubber in my igloo", but it continues beautifully as a tale of a friend taken from this world prematurely. In her live performance, Amos brings a clarity to her story-telling and this number really stood out for that. Ribbons Undone, which was performed solo, garnered an added gravitas with the presence of its subject matter, Amos's daughter, Tash, at the show. Snow Cherries From France, ostensibly a whimsical ditty about an all-too-brief love affair, showed its true colours as a little sad heart-breaker, with Amos's fragile delivery of its devastating final line: "Oh, but then he let me go". Shenale's work really came into its own with a new orchestral interpretation for what was originally a remix of Boys For Pele track, Hey Jupiter. Armed with percussion, the Dakota version of the song was a definite high point for the evening, alongside Star of Wonder, which had an extended Middle-Eastern feel introduction, further showcasing Shenale's excellent work. At encore-time Amos brought him on to the stage to take a bow with her, the orchestra and conductor Jules Buckley, who did a stellar job steering this musical spectacular.